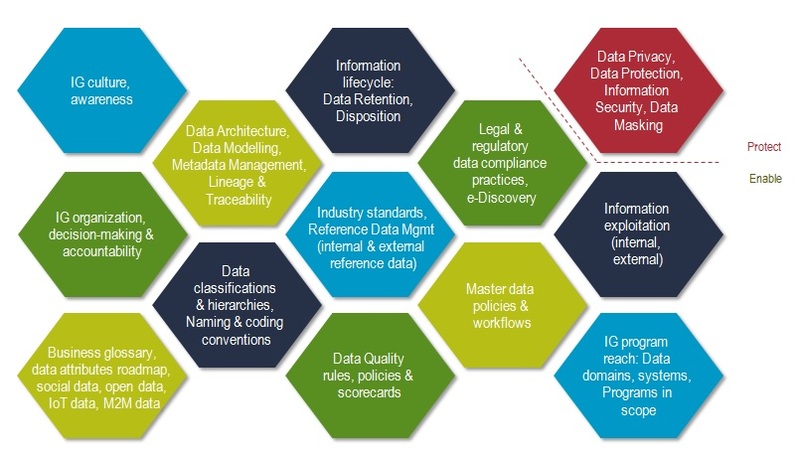 The world of Analytics, Big Data and Data Science requires consistent and credible data standards, business term definitions, master data policies, processes and hierarchies. Capgemini provides pragmatic, cross-functional Information Governance services that help organizations overcome obstacles towards achieving measureable business benefits. Organizations are often mature in Business Intelligence and Master Data Management, but have struggled with complex, opaque and ineffective Information Governance (IG) programs or have completely avoided the challenge in the first place. By neglecting IG, they risk undermining their analytics, big data and data science ambitions. Also, large organizations often struggle with volumes of data policies and procedures that are either out of date or poorly enforced. Preventing costly, data-related delays in large implementation programs. So it is not the what or why that organizations want to understand better, but the „how”. How do you set up your IG program in a way that it produces effective results, across all relevant business units, departments, core systems and business processes? Usually takes a data domain-centric approach – this is where organizations often lack experience. To ensure success, IG programs need to be practical, pragmatic, active, inclusive, business value-driven, and solution-focused. And once the IG foundation is built – and the guiding principles of efficiency, enforcement and enablement are being followed – these programs can become highly successful, with significant return on investment and deeply engaged stakeholder communities. It is important that IG programs are metrics-driven and managed by pre-defined key performance indicators that are aligned to the business drivers. This often challenges organizations to monitor their program’s effectiveness. But it is a necessary capability towards generating real-world cost savings and business value. Another key step is for all stakeholders to acknowledge that it is the business that owns, leads and prioritizes IG, while IT operationalizes, drives and supports it. Therefore, IG should be a responsibility of the Chief Data Officer. Capgemini’s IG framework (QuickStart IG for less mature organizations, Active Data Governance for more mature clients, especially those in financial services), together with accelerators, templates, catalogs and best practices, are all based on our countless client engagements across different industries, countries and cultures. Help them implement business glossary, metadata management and data governance tools. Whether you need advice on direction at the early stages of implementation, a knowledgeable sounding board to work with you along your journey, or a highly competent and experienced technical partner who can operationalize your IG program, Capgemini can help. We will ensure your IG program starts successfully and endures once the organization has become self-sufficient in managing its wide-ranging IG interests.